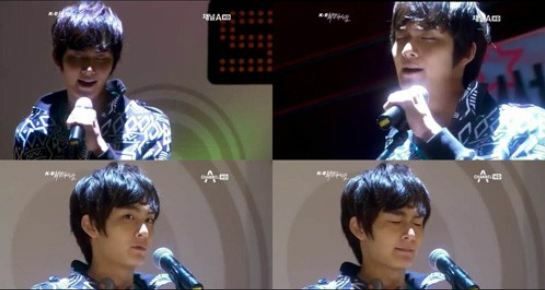 Jo Yoon Woo revealed his vocal strength public which has been hidden for a long time in KPop – The Ultimate Audition (Strongest Survival). Rookie actor Jo Yoon Woo shows his singing strength in the drama series The Strongest K-Pop Survival which debuted on March 19th, 2012, successfully attracted the attention of netizens and women. In the scene of singing that was broadcast, Dong Woo who is played by Yoon Woo uses a beautiful voice to perfectly convey his confession to a woman he loved. Under the combination of lyric and circumstance, it aroused the feeling of intense heartbeat. In addition, during the selection process for the singing, president put sandwich into mouth, Dong Woo has to live with the temptation of the appetite, closing his eyes and continuing singing. The cute look let female audience to naturally arouses instinct of protection, becoming a topic. After the broadcast, netizens said, “The singing looks good,” “Yoon Woo is handsome,” “The eyes closed very cute,” “Acting skill of idol, a very good match!” “I want to listening to OST” and so on.